Dahl has got to be one of the most comforting dishes ever. Lentils are full of protein and fibre so their great for the gut and red ones are particularly great because they cook quickly, bursting and softening for that deliciously creamy dahl texture. I add flaked almonds to my tarka for a bit of crunch and nuttiness, it’s the best combination with the coconut and turmeric dahl. Add a tablespoon of coconut oil to a medium saucepan on medium heat, add the onion, garlic, ginger and turmeric, and cook for two minutes, stirring regularly. Add in the lentils and cover with the water. Bring it to a boil, then turn down the heat a little and let simmer for about 25 minutes. Stir in the coconut milk and let it simmer for another 5-10 minutes, until the liquid is absorbed and you have a porridge like consistency. While that’s simmering, add a tablespoon of coconut oil to a frying pan on medium heat. Add in the cumin and mustard seeds, chili flakes and flaked almonds and cook for about 2 minutes, tossing regularly, until the mustard seeds start to pop and the almonds are golden. 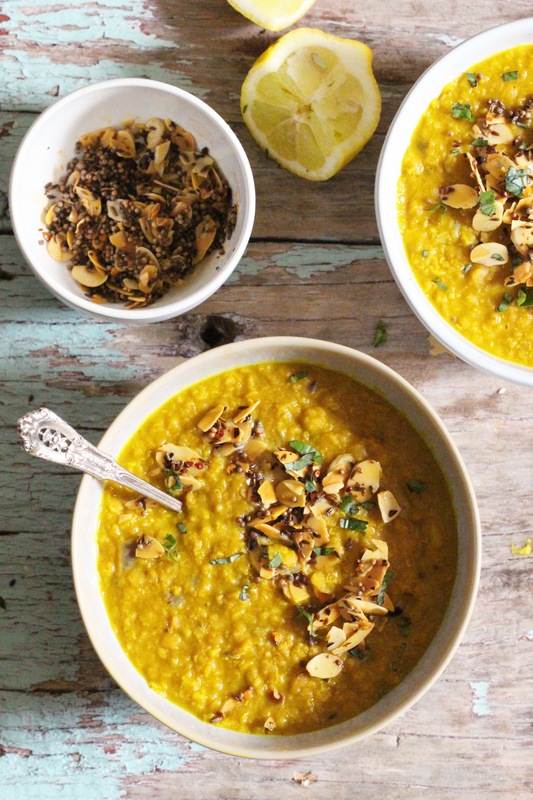 Serve the dahl topped with the spices and almonds and a sprinkling of coriander. You can also add a squeeze of lemon if desired. I’ve never been fond of Dahl but something about this recipe intrigued me. When I was out today I picked up a pack of lentils (I had everything else) and I made it for dinner tonight. I was alone so halved the recipe and will eat the rest tomorrow. It’s really nice! I added some salt and I had some coconut flakes so toasted them along with the almond/spice mix. I’ll make this again, certainly. Thanks so much for turning me on to lentils and Dahl! I’d recommend! Hi Indy, could I add fish or some sort of meat to this, or keeping to the vegetarian side could I add extra veg to it?